the Rendlesham Forest event has the wrong date and time. 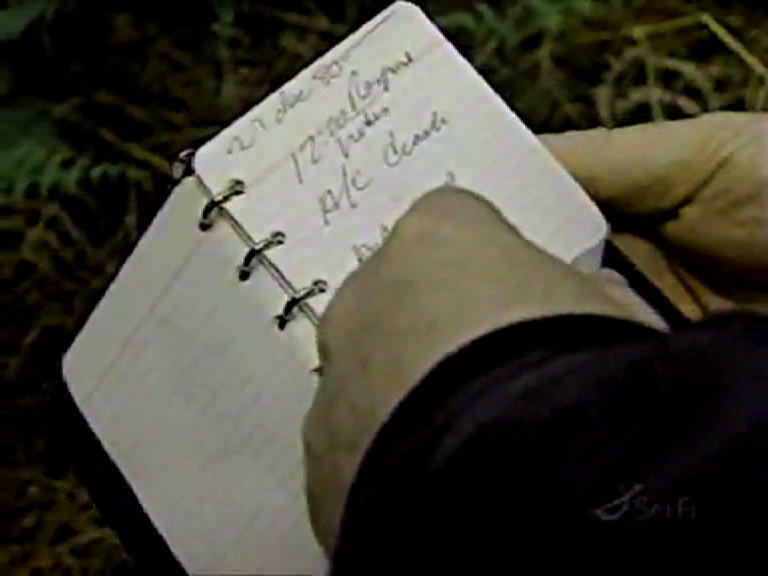 Potentially one of the most explosive documents in the Rendlesham Forest case – if not all of UFOlogy – is the notebook allegedly made by Sergeant Jim Penniston during the UFO encounter outside East Gate of RAF Woodbridge experienced by himself, John Burroughs and Ed Cabansag in December 1980. The notebook contains descriptions of a landed craft of unknown origin (see below) that Penniston claims to have examined for 45 minutes and even touched, along with sketches of hieroglyphic inscriptions he says were engraved on its side. None of the other witnesses that night claims to have seen any such craft, only lights. Hence this document deserves closer scrutiny than it has hitherto received. The results raise serious doubts about its authenticity. Penniston claims to have made these notes and sketches at the time of the incident. When I asked him in 2010 April, via the Rendlesham Forest Incident online forum, to explain the inconsistency in date and time with the known date and time of the incident (i.e. 3 a.m. on December 26), he replied that the figures in his notebook “are the actual time and date of the event”. Unfortunately, we have independent evidence that they are not. This basic error in date and time is enough to raise serious doubts about whether the notes were made during the encounter as Penniston claims. Click here for a 45-second clip from the Sci Fi channel programme in which Penniston turns the first few pages of the notebook before stopping, apparently in emotional turmoil. Is Penniston acting for the camera? Later on in the same programme, he reads through more of the notes, which end: “Liftoff 2.45. No sound. No air disturbance. Takeoff. Unknown speed. Impossible.” Some additional pages from the notebook were also shown in the History Channel’s documentary called Britain’s Roswell first broadcast in 2005 December, and a documentary called I Know What I Saw aired in 2009 December (for a 2-minute clip of Penniston’s description of his encounter from the latter programme see here). Unfortunately, none of the programme makers seems to have subjected this vital document to independent scrutiny. When was the notebook first mentioned? What other information can we find about the origin of Penniston’s supposed ‘real-time’ notes and sketches made in Rendlesham Forest? The first mention of them that I can find is in an interview with Penniston by Salley Rayl for Omni magazine – the date of the interview is not given but the website on which it appears is copyrighted 1996. Penniston made no mention of any notes or sketches in the extensive interviews he gave for a British TV programme called Strange But True? in July 1994. In the Omni interview Penniston says that the object was sitting in a clearing when he approached it. However, now that we have had a chance to see the notebook for ourselves on three separate TV documentaries there is no sign of this fluently written passage. Rather, the notes visible on the pages shown to camera are brief and disjointed. Was Penniston simply idealizing his description for Salley Rayl, or is there another explanation? Perhaps the first person to see Penniston’s notebook after the alleged UFO encounter was a security guard at Bentwaters, Richard Bertolino. Bertolino recalls sitting next to Penniston on the pick-up bus after they both came off duty that morning, within hours of the event. In an interview with the Earthfiles podcast broadcast in 2009 September, Bertolino recounted that Penniston “pulls out the notebook and he diagrams what he saw out there. It was kind of diamond-shaped with tripod legs.” From this, it sounds as though Penniston sketched the object for Bertolino as they sat together. Bertolino does not mention seeing any existing notes or sketches of the craft in the notebook. And where is this diagram made for Bertolino in the notebook that Penniston now displays for the cameras? There are other troubling inconsistencies. In Penniston’s undated witness statement made shortly after the event he drew the craft as boxy in shape and apparently on legs. An inset detail of the craft is accompanied by a question mark, presumably indicating some uncertainty. One is left to wonder why he would query the drawing if he had examined the craft in close-up for 45 minutes. In another, more detailed sketch, made at some unknown time and dated “27 December”, Penniston depicts the craft as triangular, like the landing marks, and shows it from three directions: front, side and top. The impression is sometimes given that this sketch of a triangular craft was part of Penniston’s original witness statement, but it was not. Neither does it come from his notebook, because the paper is different. This sketch seems to have surfaced around 1997 at the same time as an interview he gave with Salley Rayl, and was published on the Microsoft Network's UFO forum. Col Ted Conrad, the base commander and boss of Lt Col Halt, interviewed Penniston a day or so after the incident. As Col Conrad recalled in 2010 for researcher Dave Clarke, Penniston simply reported that he and Burroughs moved through the trees towards an unknown light which disappeared behind a low rise in the direction of a farmhouse. There was no mention of an encounter or a notebook. “Penniston said he didn't get close enough for a detailed look,” recalled Conrad. Given the doubts and questions surrounding these notes and sketches, it would be unwise to rely on them as evidence for a landed craft in Rendlesham Forest. On the 30th anniversary of the event in December 2010 Penniston added a new twist to this part of the story. He claimed that the day after the initial encounter with the landed craft, he wrote down in his notebook many pages of binary digits that he had received telepathically. At the same time, he changed his explanation for the date and time shown in the notebook: he now says it was when he wrote down the binary, not when he encountered the craft. Unfortunately, as we can see for ourselves, the date and time is at the start of the description of the craft, and not at the start of the section with the binary codes. Hence Penniston’s revised explanation for the wrong date and time is contradicted by the notebook itself. In addition, he also changed his story about the location of the landing site. Instead of claiming to have encountered the craft on the western side of the forest, nearest to East Gate, he now says the encounter did indeed take place near the eastern edge of the forest but much further south than the site with the ‘landing marks’ investigated by Col Halt. Unfortunately, this is not supported by the sketch that was included with his witness statement. * Penniston usually refers to what he allegedly encountered as “a craft of unknown origin” but has specifically and repeatedly denied that it was extraterrestrial. So where was it from? After undergoing regression hypnosis in September 1994 he seems to have become convinced that it was a craft from tens of thousands of years in the Earth’s future. According to what Penniston told the hypnotist, it contained our distant descendants returning to obtain genetic material to keep their ailing species alive: “They are time travellers. They are us,” he said.